I first encountered Eventide’s UltraTap delay as an algorithm in their H9 processor, but it has now become available as a plug-in in its own right. UltraTap is authorised to an iLok account and two installations are permitted, so you can have one linked to an iLok and one to a specific computer if you wish. UltraTap isn’t just another multi-tap delay — it is infused with a generous helping of Eventide weirdness, enabling it to create crunchy delays, comb filtering, volume swells, reverb-like effects, volume modulation and more. You can also use the horizontal ribbon at the bottom of the plug-in window to morph between different sets of control settings. The end points on the rings around the controls set the fade range for each control, which shows up in blue. In DAWs that support MIDI control of effects plug-ins, the ribbon follows MIDI mod wheel control messages. There’s also a Hotswitch button that allows you to instantly jump between two settings, the idea being to make the plug-in as hands-on as the hardware when it comes to control. Here, you press and hold the Hotswitch button until it blinks, then move the control to its new setting. The best way to appreciate what UltraTap can do is to examine the signal flow, which runs in the order Pre-delay, Tone, Slurm, Chop and finally Tap Delay. And to follow this you need to know what Slurm means! According to the designers, Slurm uses varying, random, multi-voice detuning, modulation and reverb diffusion smearing to make the taps sound less focused. Which it does. Chop is a level modulator with a choice of triangle, sawtooth, ramp, square, or Sample & Hold LFO waveforms, and is capable of various tremolo effects as well as volume swells and some gate-like effects. The LFO can be sync’ed to the host tempo or set using a tap button. Other controls include Length, which sets the duration of the multi-tap burst up to a maximum of four seconds. The number of taps can be set between 1 and 64 using the Taps dial. Spread also relates to the delay taps, this time adjusting the tap spacing. Values left of centre make the taps more closely spaced at the beginning of the burst, producing a slowing-down effect, whereas clockwise of centre values group taps towards the end of the burst to create a speeding-up effect rather like the sound of a spinning coin coming to rest. Taper adjusts the level fade-in or fade-out of the taps, and when deployed in stereo, Width adjusts the stereo image width of the taps by sending more alternate taps to opposite speakers as the value is increased. Tone either cuts or boosts the highs in the tap signal. 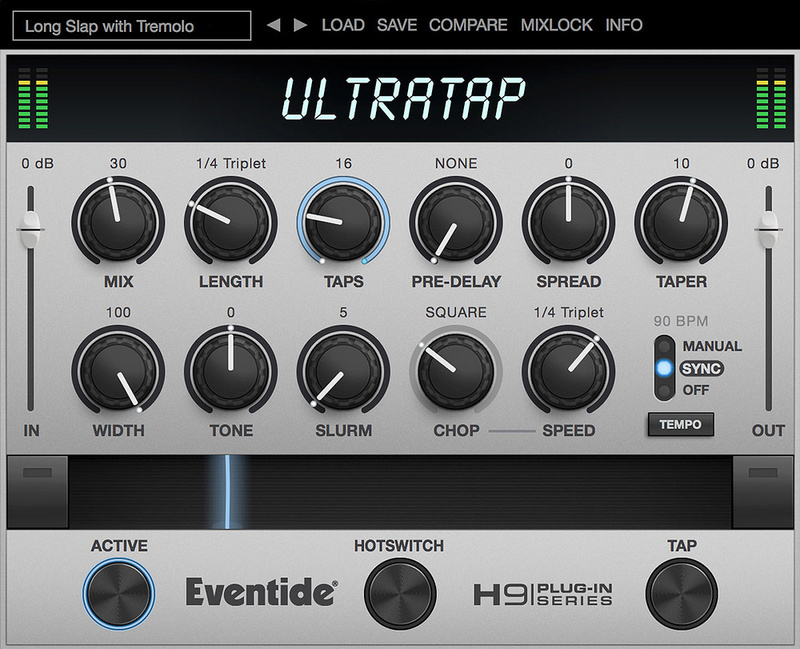 UltraTap is a fun creative tool both for musical applications and for more general sound-design work. For music it can produce high-quality conventional echoes or fake double-track sounds, lush modulated delays, vocal thickening, rapid delay bursts that sound rather like gated reverb and a few more overtly modulated and rhythmic sounds. I’m never quite sure where to use a speeding-up or slowing-down burst of delays in a musical context, but judging by the artist presets, there are producers and engineers who’ve found a way to make use of it. Automating the ribbon also provides the opportunity to glide smoothly between settings. The more you play with the deceptively small number of controls, the more sounds you’ll find you can coax out of UltraTap, so if you feel your delay treatments are getting into a bit of a rut, take a closer look.